Transplants often mean the difference between life and death for people with renal failure, but kidneys are not readily available to all who need one. The donor shortage frequently leaves people in waiting, trapped on dialysis for extended periods of time with no known end in sight. The wait time is nearly five years on average for a deceased-donor kidney via the national registry. Because people can survive with just one of their two kidneys, transplants from living donors are an option too. Living donor transplantation has saved countless lives but traditionally meant finding a compatible donor amongst a person’s close friends and family, which isn’t always possible. As of 2016, more than 121,000 people are waiting for life-saving organ transplants in the United States, and over 100,000 of them need a kidney. The National Kidney Foundation reports 3,000 new people are added to the list every month, while 13 people die each day waiting for kidney transplant. The disparity between supply and demand is at a crisis point, but experts are developing innovative ways to expand the donor pool. Living donor transplants require the donor and recipient to have compatible blood and antibodies. If a friend or relative wants to donate but isn’t compatible, what can be done? That’s where kidney swaps come in. A kidney swap facilitates odd pairs to find matches with individuals outside their orbit. Kidneys from perfectly matched donors can function for over thirty years. A swap can go something like this—your brother needs a kidney, and you want to donate but your blood type isn’t a match, or you have particular antibodies that may lead to a rejection. The solution? You give your kidney to a stranger who is a match, and their friend or relative donates a kidney that is compatible with your brother. It’s a game of matchmaking that would make Yente proud. In 2004, Lloyd Ratner, MD, Director of the Kidney and Pancreas Transplant Program at Columbia, became the first surgeon in New York state to perform a two-way kidney swap, involving four people (two donors, two recipients). Since then, even larger swaps have been performed, including a mega-chain in 2007 that brought in sixty people, thirty kidneys, and seventeen medical centers from all around the country. These paired exchange programs have created matches for people who wouldn’t find a kidney otherwise and have saved thousands of lives over the years. But there are some drawbacks to such a sprawling transplant network: time, distance, money, and the many unpredictable factors in between. Next, there is the issue of organ viability. The longer a kidney remains outside a human body, the less likely it is to function well initially. Fast and easy access is the key. “It’s much easier to do a swap between New York and Los Angeles since there are direct flights several times a day,” says Dr. Ratner, “It’s far more challenging to arrange one with a patient in a small town in rural Pennsylvania.” You have a better chance if you can get to a major city. Another impediment is financing. It’s essential to work within the complexities of healthcare coverage to secure swaps as efficiently as possible. Insurance companies have agreements with certain hospitals while others are out of network; In some states, like New York, Medicaid won’t pay for a kidney that has to be flown in from out of state. Figuring out who will pay for the surgery, and where, is inherently tricky for most Americans. Dr. Ratner says that smaller swaps can alleviate some of the burdens. Swaps are far from the only option. With a passion for the art of matching and pragmatic approach to kidney acquisition, wait times for donor organs can be much shorter—as Dr. Ratner has demonstrated at Columbia, where waits times have been cut by more than half, on average. “It’s because we’re good at finding the right match,” says Dr. Ratner. Most hospitals take only the strongest and most durable deceased-donor kidneys for transplantation. “Four out of five donor kidneys we use have been turned down by other institutions,” says Dr. Ratner. These aren’t bad kidneys. Some may not be perfect on paper, but matching requires a personalized approach—finding a great fit for the individual. Small swaps are best. It’s safest to go to a kidney transplant center with a large pool of local donors, allowing them to limit their swaps to no more than two or three matched pairs at a time. Living donor transplantation is less invasive than ever. With new minimally-invasive techniques, living donors now heal faster, with less post-op pain, and better cosmetic results. Their time in the hospital has been cut down to two days. Hospitals that encourage living donors can choose from more healthy organs. There are new treatments for incompatible donors. If a perfect match isn’t available, it is possible to match incompatible donors. Special techniques allow doctors to filter the blood and remove antibodies that might cause rejection. This approach is called plasmapheresis and can be combined with IV immunoglobulin. It’s available at major transplant centers. 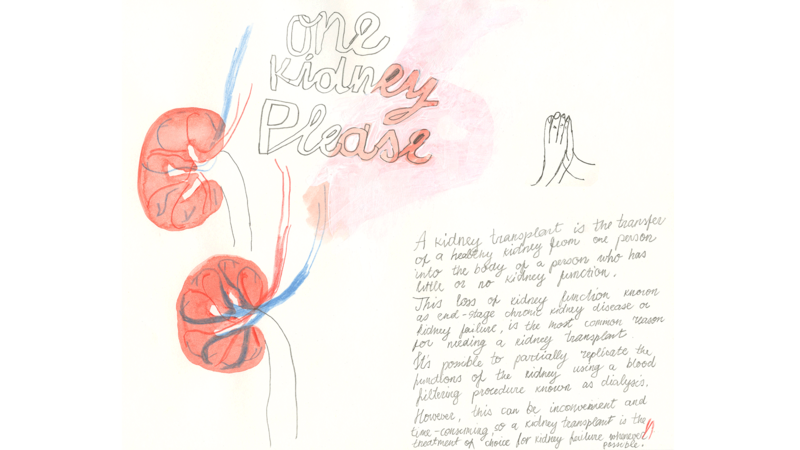 Less-than-perfect kidneys can be repaired for transplant. A kidney does not have to be 100% to dramatically improve the quality of life for a person with kidney failure. Skilled surgeons can fix certain defects. It’s now possible to use two suboptimal kidneys to perform the function of a single “perfect” kidney transplant. This approach often works well in patients 65 and older, giving them a reprieve from dialysis, and many added years of life. Interested in becoming a living donor? You can register online today.